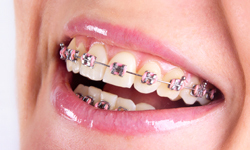 In most cases, teeth can be corrected by simply using the traditional type of metal braces. This also tends to be the most cost effective method. This is why we use metal braces the most often. However we do cater to our patients individual needs and concerns. If you would like information on using alternative types of braces don't hesitate to ask our Orthodontist. They will be happy to explain their recommendations and thoroughly explore all options with you.